We can officially say Spring is in action, despite the UK weather being pretty unpredictable (which is actually, pretty predictable), I've still been wearing my Spring favourites. 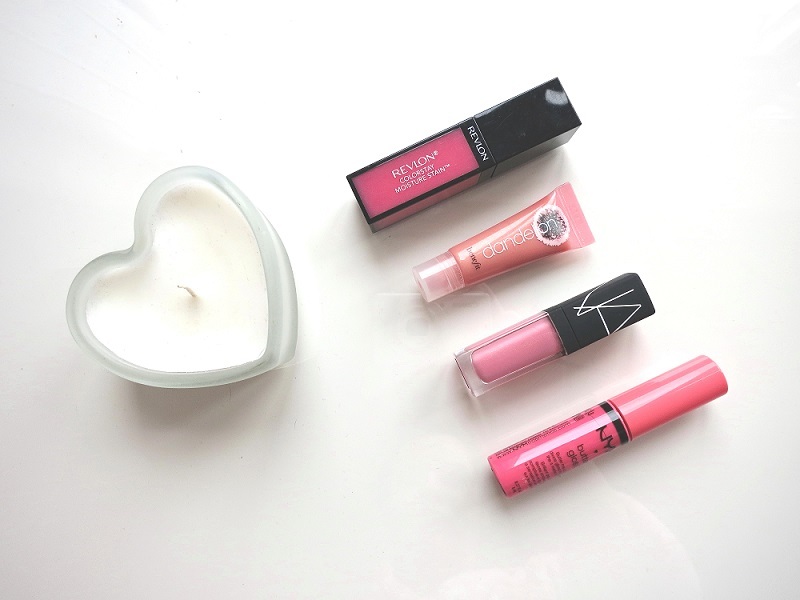 I like to wear a lot of lip gloss in the Spring/Summer, I just think it's so girly and fun perfect for this season. It's easy to apply on the go and looks gorgeous with a tan! Last year I found myself wearing Revlon's Colorstay Moisture Stain in LA Exclusive soooo much, so I'm definitely going to be using my trusty old favourite a lot this Spring too. the colour pay off is amazing , these lip glosses are so pigmented a little bit really goes a long way. I love the formula of these, they're super glossy but also creamy and moisturising as well. LA Exclusive is a pretty bubblegum pink, the perfect shade for a cute girly look. I love this shade this season, it looks gorgeous with natural makeup but it can also be worn in the evening, as it has a great colour pay off and can be pretty vibrant too with heavier application. I love the applicator on the Revlon Moisture Stains too, it's very wide and soft, so easy to apply! Although I do love my pinks in the spring, I can also be persuaded by a good peachy/pink shade too! When I'm feeling the natural/peach shades, I go for my Benefit Dandelion Ultra Plush Lip Gloss, I only have a mini of this that I picked up over Christmas time, but I could definitely see myself buying a full size. Dandelion is very sheer so it's great for work etc. or just everyday natural makeup. I don't tend to wear this in the evening, it's definitely more of a day time shade. The squeezable tube makes this so easy to apply through out the day. I love this when I just want to pop out quickly, or if I'm busy at work - it just adds a gorgeous shine to your lips and makes them look more plump and healthy. Another mini I absolutely looooove to have in my bag at all times is, NARS Istria. This is a beautiful baby pink with a silver and gold shimmer. It's very glossy and shiny but the colour pay off isn't too much, making this the perfect shade for Spring day. It will go with pretty much any make up look. Isn't it just the cutest mini you've ever seen!? The newest additions to my lip gloss collection are the NYX Buter Glosses. I recently picked up sooo many of these (they're only £5!). The colour pay off is amazing in these glosses, they're probably the most pigmented glosses I've tried! I really want to do a review on these soon but for now, a great shade for Spring is Peaches And Cream, a creamy pink with a subtle peach hint. The shine is gorgeous and the formula is creamy, making this so easy to wear. 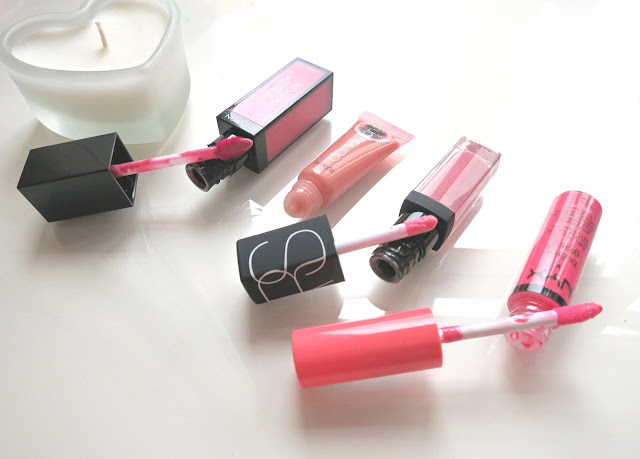 I love that you can either get a cute pink shade - great to add a little bit of colour to your lips, or you can apply a little bit more and get a more vibrant colour - great for a sunny day out! Do you reach for your glosses more in Spring? What do you go for - the everyday shiny, hardly there shades or the more vibrant and bright shades? Don't forget you can win two Essie Polishes in my Essie Haul & Giveaway Beauties! They all make your lips very plumped! I'd love to try more from NARS. Thank you! Yes I'd say NARS is probably my favourite brand, their products are gorgeous! I love Nyx Peaches and Cream, it's so pretty! I know right, it's so cute! I'm loving NYX Butter Glosses atm! 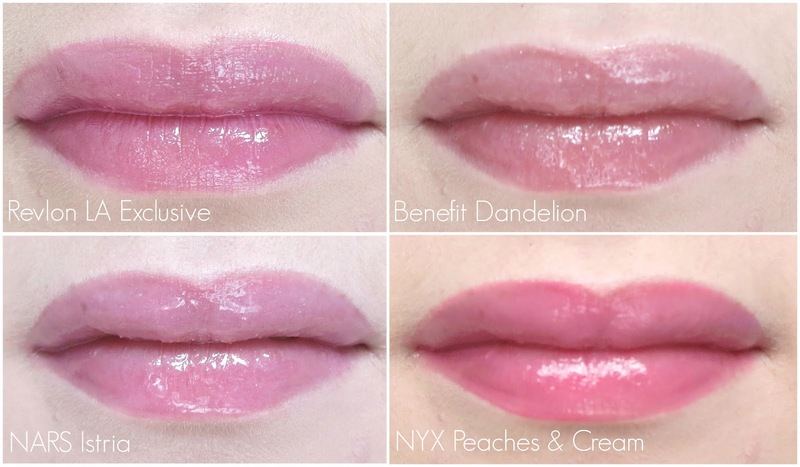 I love the look of all of these, but oh my gosh that NYX Butter Gloss looks stunning! Thank you! They're so affordable too! That NYX lipgloss looks beautiful, such a pretty colour and perfect for Spring. Think I'll have to pick that up. I love the NYX Peaches & Cream. It is such a pretty shade!! :) new follower here!